Olimp Dextrex Julice is a high quality carbohydrate supplement containing dextrose in pharmaceutical quality, enriched with taurine and magnesium. The preparation quickly and effectively supplies energy to working muscles, as well as ensures efficient glycogen resynthesis after the physical exercise. The addition of taurine allows for proper contractility of skeletal muscles and their protection against catabolism. Magnesium, on the other hand, participates in the energy production. Dextrose is a glucose isomer classified as monosaccharide. This sugar is characterized by a high glycemic index (IG = 100), which means that it quickly raises the level of glucose in the blood, which can then be used for energy purposes. Dextrose does not burden the digestive tract, therefore it can be effectively used even during physical activity. In addition, if taken after the workout, it reduces the time necessary for the resynthesis of muscle glycogen, and thus accelerates the recovery of muscles before the next exertion. The manufacturer ensures the pharmaceutical quality of dextrose, which quickly passes through the digestive system and effectively raises the level of sugar in the blood. Taurine - a non-protein amino acid found in almost every cell of the body. It takes part in the storage and transport of nitrogen in the body, preventing the catabolism of skeletal muscles, which can take place especially during a long-term activity. This amino acid ensures the fluid balance in cells, improves insulin sensitivity of tissues and intensifies insulin synthesis, ensuring an efficient supply of glucose to the tissues. In addition, taurine regulates the supply of sodium and calcium ions that ensure normal muscle contraction. It also intensifies the transport of creatine to skeletal muscles, promoting the production of high-energy compounds. Magnesium - an element that participates in over 300 reactions in the body. It is necessary for the proper functioning of the nervous system and the production of high-energy compounds, such as adenosine triphosphate (ATP). ATP as an energy carrier in the body, allows to increase the strength of muscle contraction and increase the intensity of training. Magnesium also prevents involuntary contractions of the skeletal muscles, increases energy levels and improves insulin sensitivity of tissues, preventing high blood glucose levels. Consuming simple sugars for a moment before or during training, allows you to deliver the fuel preferred by the muscles and improve the body's efficiency. Quickly absorbed and easily digestible carbohydrates are the best way to improve the sports performance without hurting the digestive system. It has been proven that an additional portion of energy derived from simple sugars effectively delays the fatigue, prolongs the duration of exercise to exhaustion and allows you to increase the strength and the ability to generate the muscle power. An efficient renewal after the physical exercise is extremely important, especially when the time between the trainings lasts several hours or more. Then the priority is to replenish muscle glycogen stores. It is a glucose storage for skeletal muscle, which can be used regardless of the supply of glucose from food. 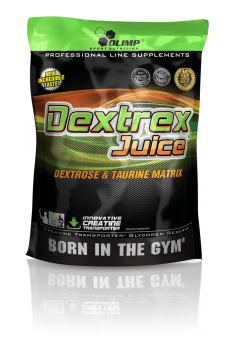 Dextrose quickly and effectively raises the level of glucose, and the synergistic effect of taurine and magnesium ensures its proper metabolism and prevents the maintenance of the excess glucose in the bloodstream. In summary, Olimp Dextrex Julice provides dextrose of the pharmaceutical quality enriched with taurine and magnesium. This combination quickly and effectively delivers glucose to the working muscles, allowing you to increase training performance and extend the duration of your effort. In addition, the supplement works anti-catabolic and improves the transport of creatine to the muscles, through which it is possible to increase the perceived energy. What is more - the supplement promotes the post-training muscle glycogen resynthesis and shortens the time needed for regeneration before the next workout. Malic acid, citric acid - acidity regulators, flavors; colors: riboflavin, beta-carotene (for orange flavor), E 133, riboflavin (for apple flavor), riboflavin (for lemon flavor).